Our Products >> White sapphire silver wedding set inlaid with Australian opal. Australian opal wedding ring set accented by white sapphires in sterling silver by Hileman Silver Jewelry. Beautiful inlaid blue-green Australian opal surrounds two round brilliant cut white sapphires in each of these unique opal wedding rings. His wedding ring has 2 channel set white sapphires totaling .16 carats. His ring is 6mm wide and is shown in a size 10 1/2 for scale. This opal wedding ring set available by special order only (not in stock) and will be made to order in your ring sizes in 4 to 6 weeks. Both rings are hand signed "MMH" by Mark Hileman on the inside of the ring. Her opal wedding ring also has 2 channel set white sapphires which total .10 carats. The blue-green Australian opal in her wedding ring is a perfect match to the Australian opal in his wedding ring. Her ring measures 5.5mm wide and is shown in a size 6 1/2. It is also available in other sizes and color combinations. **OUR SUPPLY OF THE BLUE OPAL IN THESE RINGS IS CURRENTLY LOW. PLEASE CONTACT US FOR AVAILABILITY. WE HAVE MANY OTHER OPAL CHOICES AVAILABLE. CONTACT US FOR DETAILS. Opal has been mined worldwide, however, Australia accounts for 96% of all commercial opal and is the main source of precious opal. Australian Opal is mined in many locations throughout New South Wales, Queensland and South Australia. The main areas of production are Mintabie, Lightning Ridge, Coober Pedy, Andamooka and Queensland. Most opal in Australia is found in Cretaceous rock with one exception; opal from the Mintabie area is found in Paleozoic rock. Australian Opal may form in vertical or horizontal seams in the sandstone as well as in fossilized formations. Because of the unique conditions under which opal is formed, it is nearly impossible to find two opals exactly the same. Opal is the only gemstone known to man to have the natural ability to diffract light. An opal's color is created when the voids between the particles split light entering the stone. The size and alignment of the spheres and voids, as well as the light source, determines the colors produced. To view an opal's color play at its best, the light source must be coming over your shoulder. An opal's color can cover the full spectrum of the rainbow. These rings may be purchased as a set or sold separately. Also available as a His and His ring set or Hers and Hers combinations. *THE PRICE LISTED BELOW IS FOR THE SET! If you would like to upgrade to tarnish resistant Continuum sterling silver, check the box and then type "Upgrade me to Continuum silver" in the pop up box. Black diamonds are also an substitution option. Check the box and type "Substitute black diamonds" in the pop up text box. 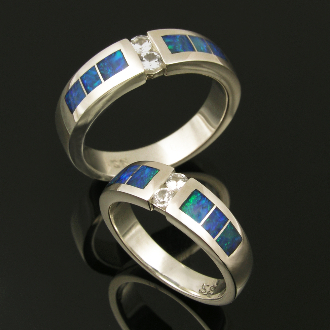 We also offer this wedding ring set inlaid with lab created opal in a variety of colors!